It is possible to make too much of the distinction between the beliefs and practices of the monks (lamas) and of the common lay people. Lamas (in both Buddhism and Bön) may function as shamans and perform rituals to purge evil spirits. Lay people are not entirely ignorant of Buddhist precepts. The distinction becomes stark, however, when we look at the reasons and goals of the respective groups for practicing the religion. For the lamas it is the attainment of Nirvana and enlightenment, whereas for lay people it is usually the accumulation of merit for the sake of improving one's karma. In fact, there are those for whom the religion pretty much begins and ends with warding off evil spirits so as to have a successful life. For the people whose motivation focuses on the accumulation of merit, there are many ways of fulfilling that goal. Most of these items and activities have three levels of significance: as a way of controlling the spirit world, as a way of making merit, and as a symbolic action that on a small level (microcosm) enacts the realities of the Buddhist world view (macrocosm) and thereby contributes to a person's enlightenment. Most people perform their religious obligations within the first two stages (warding off evil spirits and gaining merit), but, as mentioned, even high-placed lamas do not ignore the animistic features. Coincidentally, a number of the available helps begin with the letter "M," and it has become customary to speak of the "four M's," but actually we can add some more. Meditation. Strictly speaking, meditation is a practice reserved for lamas, who follow particular techniques. However, we need to start by mentioning it because some of the other practices were originally tied to meditation, before they took on a life of their own. One does accumulate merit by meditating, even if the achievement of Nirvana is still out of reach. The goal of meditation is to experience the benevolence of one's deity, internalize it, become the deity, and in the process recognize that the deity and you are identical because neither of you are real. Along the way to that realization, one must purge all unhelpful hindrances that often take on the appearance of demons as they escape from the meditator. Mantra. The use of mantras goes much further back than Tibetan Buddhism, of course. We find them in earlier Hinduism and Buddhism. A mantra is literally a "powerful sound," a way of affecting the spiritual forces of the universe by uttering the appropriate words. It may be a single word, a phrase, or even a mere syllable without any literal meaning such as "Om." Generally, the literal meaning of the mantra is not nearly as important as speaking it correctly. 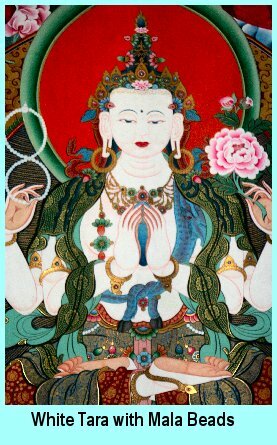 Saying a mantra can protect one from evil forces and invite gods and bodhisattvas to come to one's aid. But even if there is no particular intervention in view, simply the act of reciting the mantra is a way of accumulating merit. The most common Tibetan mantra is "Om mani padme hum," which is actually the specific mantra for Avalokitesvara. It means literally "Om. The jewel in the lotus. Om." "Mani" is short for the Hindu concept of a cintamani, which is a mythological jewel, associated with the Vaishnavite tradition in Hinduism and with the bodhisattvas Ksitigarbha and Avalokitesvara in Buddhism. Stories about this precious stone have taken on cosmic dimensions in Tibetan folklore, but, without going out on a limb, at a minimum it is supposed to have the power to fulfill the wishes of a devoted person: a long life, material fortune, protection from various evils, and accumulation of good karma, to name a few common hopes. And consequently, mani has become the expression for reliance on this spiritual jewel. We will see the word again when we mention mani stones and mani wheels. But, as we said, the literal meaning of a mantra is not as significant as its recital. Well, okay, that last statement needs to be qualified some more. "Recital" does not necessarily have to mean verbal, oral, recitation. 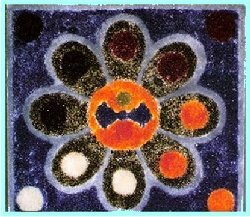 There are other mechanical means of evoking the power of a mandala, which can also generate merit as long as the one who is using it has faith in its efficacy. Mani wheels. 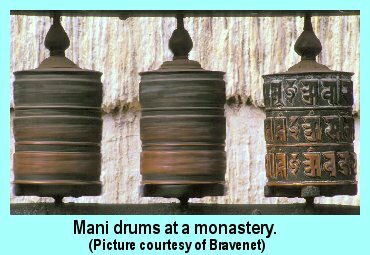 These are the objects that are popularly known as prayer wheels, but in several ways that term is not the best one to use, not just because it gives us the opportunity to list them beginning with an "M." After all, the mantras are not really prayers in the usual sense. For that matter, the "wheels" are really cylinders, drums, or--to use the more old-fashioned word--mills. Their official Tibetan designation is mani-chos-'khor, which is an adaptation of the Sanskrit cintamani-dharma-chakra. The word dharma here, of course, refers to the way of the Buddha, and you recognize the terms mani, the mystic jewel, and chakra, which does mean "wheel." So, if the original name for the implement includes the term "wheel," we can only follow suit and continue to call them "wheels" as well. The best known mani wheels are probably the small handheld ones. They consist of a cylinder in which the Avalokitesvara mantra has been written on a piece of paper. The cylinder is mounted on a handle in such a way that it can rotate freely, which it will do with just a flick of the hand, thanks to a little weight attached to the cylinder with a string. 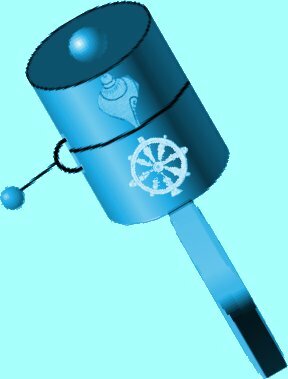 Each time the little drum turns the mantra turns with it, which has the same effect as speaking it. The outside of the cylinder can be decorated with Tibetan symbols according to the choice of the artist who made it, as well as to match the purpose for which a particular mani wheel may be designed. However, there are also ways of "turning the wheel" that would not be as taxing on someone's wrist. Temples often have rows of drums containing mantra papers, mounted in such a way that a person walking past can just start each of them turning by running his hands along their sides. Others are attached to water wheels or wind mills, and some of them can be the size of an entire building. As mentioned above, electric wheels have made the gathering of merit automatic for some practitioners, while others object to this approach as too passive. One should do something, no matter how small, to earn merit. Monument and mountain circumambulation. We readily concede that here we stretched matters just a little bit to get the M's accommodated, but not very far. 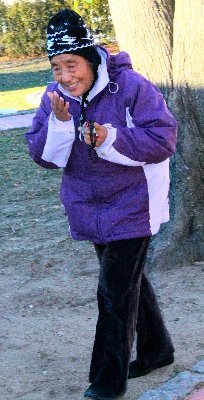 To consistently walk around a special place, 108 times if possible, is a very popular means of garnering merit. An obvious place to do so would be a chorten, which typically has a walkway surrounding it. 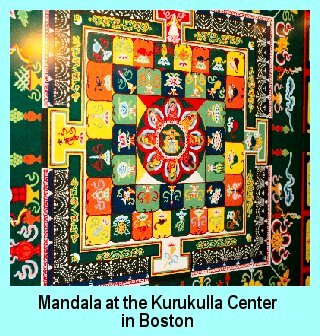 At the Kurukulla Center in Boston, devotees walk around the the entire premise, viz. the building and the adjoining chorten because otherwise the distance would be far too short to make any sense; it would merely make worshipers dizzy if they limited themselves to walking around the chorten alone. 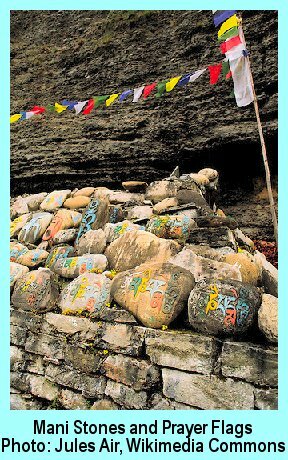 On the other hand, a fairly popular practice is to undertake a pilgrimage to a sacred mountain and circumambulate it, though perhaps not 108 times. Such an exertion may take weeks, if not months. Anyone familiar with Eastern thought will recognize the numeral "108" as an old friend, who pops up on numerous occasions in Asian thought. It is quite clearly an auspicious number. It is easy to find explanations for what makes the number 108 so special. What is difficult is to sort out which of the many proposed explanation is actually the correct one. A site devoted to meditation techniques lists forty explanations for the prominence of "108" without either endorsing or rejecting any one of them, and that's the obviously wise choice, which we will make as well. 108 is a sacred number; it is ubiquitous, and we'll leave it there. This is one of the points at which a difference in the fundamental practice between Bön and Buddhism is clearly visible. In Tibetan Buddhism, the direction of one's walk, along with the direction of turning wheels, must always be clockwise. The fear is that one movement in the opposite direction will undo the benefit on one spin in the correct one. In Bön, the accepted traditional circle goes in the opposite (counter-clockwise) direction. 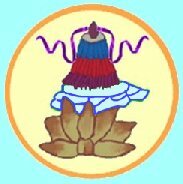 However, it is apparently not a matter of life and death for the Bönpos since, at least during this exile in India they have adapted themselves to join Buddhist marching in the clockwise direction. The desire (or even need) for adherents to Bön to be counted among regular Tibetans has led them to make a number of accommodations. Run you mouse cursor over the picture for a close-up of this gentleman's mala beads. Mala Beads. So, how do you keep track of such things as saying a mantra or circumambulating a chorten the required 108 times? You should be using a set of mala beads. In Western circles they are sometimes casually referred to as "Buddhist rosaries," making it sound almost as though Buddhism had copied the practice from Christendom. But the consensus seems to be that the concept of a "rosary" actually had its origin in Buddhism, where it served the very practical need of keeping track of how many times you have uttered the same recitation. The notion was most likely picked up from them by Muslims, and then Christians learned about the device and the technique from Islam during the Crusades. Such, in any case, seems to be the sequence in broad strokes. A complete mala obviously has 108 beads, and it is often worn as a necklace. Some malas are intended for special purposes, and they may have a different number. The material of which the mala beads of a particular necklace are constructed is also determined by the objective the recitation of the mantra is intended to attain. A mala for warding off evil spirits will consist of different kinds of beads than one intended to bring success in business. Lest you get confused if you should run across some mala beads, we need to point out that oftentimes there are more than 108 on a set. Chances are that there is a large starter bead, which does not count, and that there will be a marker bead every twenty-seven beads (one quarter of 108). These also only serve the purpose of keeping the person from getting lost in their counting. In addition, attached to another side of the starter bead may be other hardware to keep track of how many times around the entire chain one has gone. Finally, malas for the wrist are also available. These consist of 27 beads, and so the devotee needs to complete four revolutions on the wrist beads to reach the necessary 108 times. Mani Stones and Walls. Another way of ensuring that one's mantra is of ongoing use is to fashion it in durable material. A very common practice is to inscribe the Avalokitesvara mantra or something of similar value on a stone and add it to a collection of similar ones. Oftentimes, these mani stones wind up forming a wall. Prayer Flags. Sorry, no M for this point. Theoretically, one could call these pieces of cloth "mani flags," but no one seems to do so. The principle, of course, is the same: Mantras are inscribed on the flags (or implied by them), and then they are strung on lines, moved by the ever-present wind. Consequently, the flags fulfill their purpose of misdirecting evil forces as well as invoking the many good spirits and deities. Mandalas. Imagine that you could control the entire universe by drawing a picture of it, and then directing all of the spiritual forces in the world with your mind. Very, very roughly, this is the idea behind a mandala. Literally, the word comes from a Sanskrit term meaning "circle," and it has its roots in Hindu practices. 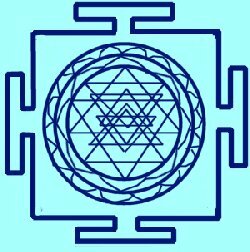 Oftentimes, Hinduism encourages someone to focus their meditation on a particular object, generically called a yantra. This yantra can be one of many different items, such as a candle, a flower, a deity, or some other thing. Sometimes it is a diagram. 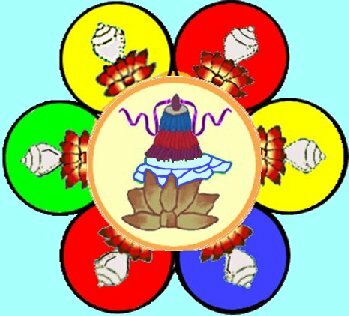 The diagrams below are that of a basic mandala in general and the Hindu Sri Yantra, which is intended to harness the power of the goddess Parvati (five triangles down) in conjunction with the god Shiva (four triangles up). Note the particular features of this blueprint. 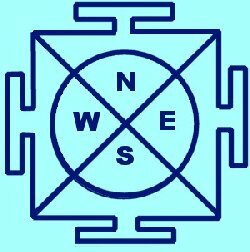 There is a circle inside of a square, and the circle is divided so as to yield four quarters, each of which is associated with one of the cardinal directions. Of particular interest are the four "gates" on each side. In a more complex mandala, large squares may be nested inside of each other, and each one will have a set of gates communicating to the one external to it. Tibetan mandalas become extremely complicated. They are also no longer just objects to gaze on, but the very making of the diagram becomes an expression of devotion. 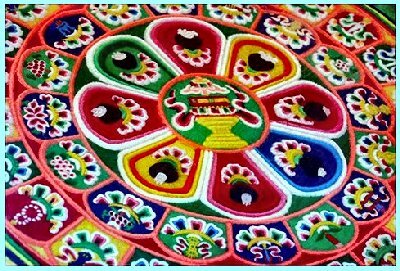 Mandalas frequently incorporate one or more of eight symbols that are considered to be auspicious. 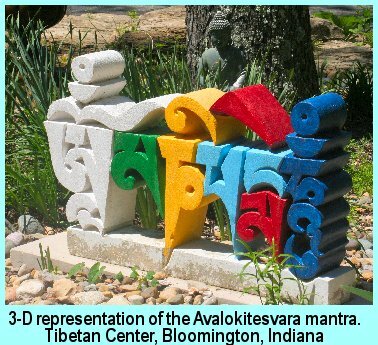 This one, from the Kurukula Center in Boston, is built around the symbol for victory. Speaking of which, here are the eight auspicious images, their meaning, and their significance. 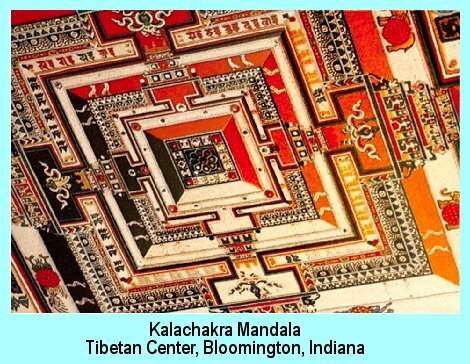 So, let us say that we wish to build a "Victory Mandala," one that serves as device to mediate spiritual victory. What follows here is just an illustration, not actual instructions on how to make a real Victory Mandala. We could place the symbol for victory at the very center. 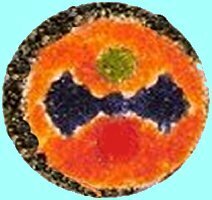 Then we could surround that particular symbol with other decorations, perhaps one of the other auspicious symbols. In this case, we have arbitrarily chosen the conch shell, whose meaning is that the vibrations of the dharma, like infinite sound waves, reach to the very end of the cosmos. If we continue to add to the circle moving outwards, we'll eventually complete a Victory Mandala. The one in the picture below is permanently embedded in a table top inside of the Kalachakra chorten in Bloomington, Indiana. You recognize, of course, that it does not show the usual squares and gates, as we saw in the one above. However, the gates are quite evident in the famous Kalachakra Mandala below, which is devoted to the highest deities and forces in the universe. Construction of the very center alone is an act of deep merit. What you finally see is five layers of decoration and adoration. The vajra is clearly visible. Then the process of adding other important decorations begins. As it expands, we see many symbolic and graphic illustrations along with several levels of gates. If you look really closely, you can see the center, as pictured above, in the very middle of this larger view. This particular Kalachakra mandala is not made in the usual way, as it is painted on the ceiling of the chorten that contains it. 1. Some lamas believe that electrical mani wheels are not really worthwhile anyway. One of them observed that, if the merit of turning the wheel goes to whoever supplies the energy for the revolutions, the spiritual rewards should by all rights go to the local power company. Obviously others disagree, but there is definitely no merit in an animated picture that illustrates a peculiar practice, and Christians need not worry about starting the video clip. They should not, however, use real mani wheels since doing so would be honoring a spirit world that does not exist within the bounds of legitimacy set down by the New Testament.